A knock on the door from a couple passing by Ken Knowles’ Rockport studio kicked off a decade of helping Cape Ann patients with cancer. 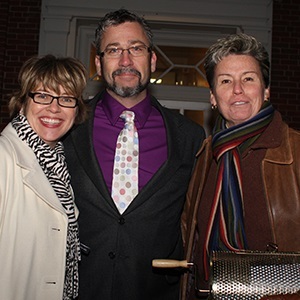 Shawn and Sue initiated Lights of Love, the annual tree lighting at Addison Gilbert Hospital, in 2008. The event raises money for cancer services for the hospital’s Gorton’s Specialty and Cancer Care Center. It was Shawn and Sue’s way of paying it forward while Sue was being treated for cancer. Sue died in 2013. She had been a tireless advocate for cancer patients. From her work on Lights of Love to other fundraisers she ran, Sue did everything she could to fight cancer so that others would have the best possible chance of conquering their disease. Ken, who’s from Rockport, donates an original painting to Lights of Love each year to be raffled off. His art is inspired by the beautiful ocean views of Cape Ann, the area he has called home his whole life. “I can’t give ten grand to any fund. But, they’ve been able to make as much as that in any given year so far with my paintings, so I really appreciate being able to help that much,” he said. This year’s painting marks ten years of donating his work to Lights of Love. It depicts Cape Hedge Beach in Rockport. 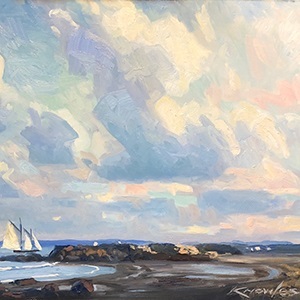 “The summer clouds, summer sun streaming across… It’s a favorite subject of mine,” Ken explained. Now in its 11th year, Lights of Love is the top fundraiser for cancer care services at Addison Gilbert Hospital. Volunteers, local businesses, and countless others donate their time, services and energy to make this event special and help cancer patients every year. “Lights of Love is an integral part of the Addison Gilbert cancer care program. It provides the community an opportunity to give back and help to provide cancer care right here on Cape Ann,” said Cynthia Cafasso Donaldson, Vice President of Addison Gilbert Hospital. In the past 10 years, donations to Lights of Love have surpassed $200,000. All proceeds from the event benefit the Gorton’s Specialty and Cancer Care Center at Addison Gilbert Hospital. For a chance to win Ken’s painting, contact Deb Sacco or call 978.381.7596. In honor of Ken’s 10th year of donating a painting, raffle tickets will cost $10. See more details about this year’s Lights of Love here.